Last year’s theme was safari, this year’s theme is steampunk — but no matter what the theme is, it’s always a blast because it’s Snowdown! This is Durango’s 37th annual Snowdown, Durango’s yearly winter celebration. Locals started Snowdown in 1979 as a way to give snow-weary residents and cold-crazed local businesses some oomph during the winter doldrums. 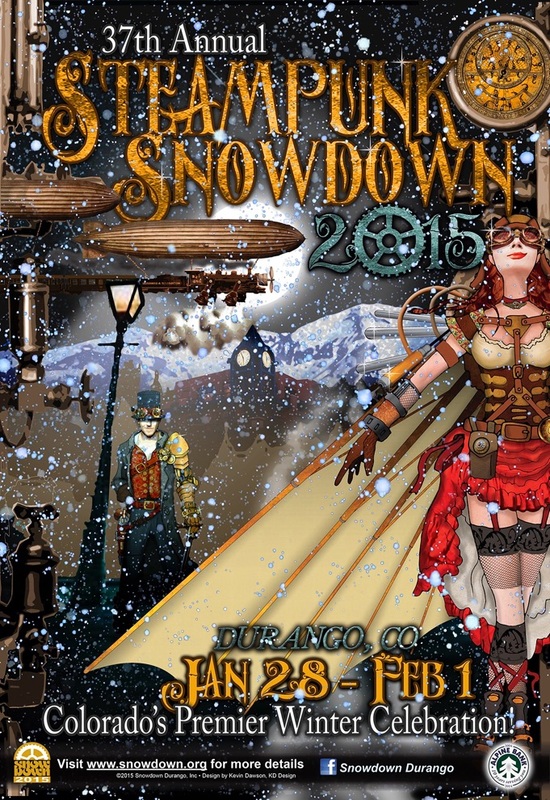 This year is Steampunk Snowdown, and the five-day party will take place Jan. 28 through Feb. 1 in Durango, Colorado. Unclear what “Steampunk” is? It’s a twisted version of 19th-century Victorian industrialism (hence the focus on steam-powered machines and gadgets). Think gears and gauges, dials and knobs, goggles and parasols — a sci-fi fantasy version of the Industrial Revolution. These are important things to remember for your costume during the Snowdown parade and ball. Although this year’s Steampunk Snowdown schedule of events has yet to be published, every day of last year’s Snowdown was packed with wild-and-crazy activities, such as a scavenger hunt, doughnut-eating contest, costume contest, bartending contest, speed-dating, trivia night, beer pong tournament and even a game of “ski softball,” a game of softball played on, well, skis and snowboards. There’s also usually a Snowdown costume ball, a Snowdown spaghetti dinner and even a Snowdown balloon rally, but stay tuned or the final lineup of events. The Snowdown Light Parade will light up downtown Durango starting at 6 p.m., Friday, Jan. 30. Friday, Jan. 23, is the final day for entries to register for the Snowdown Light Parade, so you better get on that. Call 970-749-1816 for more information about registration or fill out the entry form online. If you’ll be staying in Durango for this year’s Steampunk Snowdown, be sure to book your room at the Durango Quality Inn! We will help polish your goggles or lace your corset, if it comes down to that.